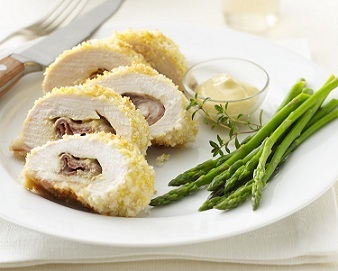 This chef’s way with chicken is actually quite easy to do-the key is pounding out the breast fillets to an even thickness so they roll up easily—and can be made ahead if you want to serve company. Heat oven to 375°F. Lightly grease a foil-lined rimmed baking sheet. Lay the chicken breasts (one at a time) between 2 pieces of plastic wrap. Using the flat side of a meat mallet or rolling pin, gently pound the chicken to 1/4-inch thickness. Spread one side of chicken with mustard. Lay 2 slices of prosciutto neatly on top of each breast, then top with a slice of cheese. Roll each piece up as tightly as possible. Place eggs in a shallow dish; mix breadcrumbs and Parmesan in a second shallow dish. Carefully dip each roll into eggs, then breadcrumbs, coating well. At this point you can cover and refrigerate the rolls, up to 12 hours or freeze up to 1 month. Place rolls onto prepared baking sheet; drizzle with 2 tablespoons of oil. Bake 20 to 25 minutes or until browned and cooked through. Serve chicken with additional mustard.